In this case, an indirect pulp cap was done by the patient’s dentist years ago, and recently became symptomatic. 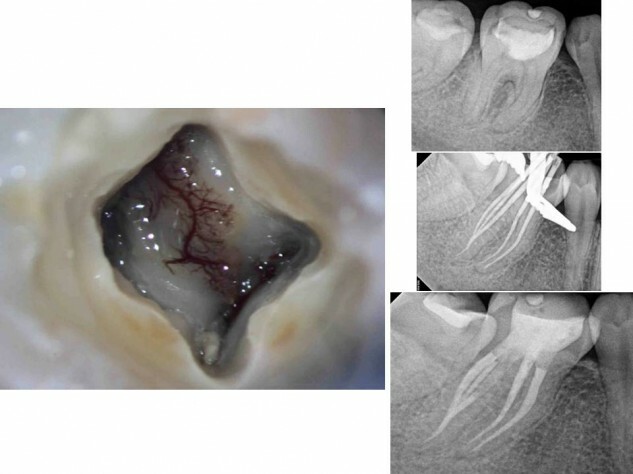 Clinical photo of the complex microvasculature in a vital coronal dental pulp. This # 30 had five canals, with the fifth being a mid-distal. Endovac apical negative pressure irrigation is useful even in this case type. Although the main canals were only shaped to a 20-07 and the mid-distal to a 20-04, the microcannula reached beyond where the distal canals merged and allowed for a high flow of irrigants through each canal, to effectively remove vital tissue from the anastamosis. Fiber post bonded in the DL canal.